If you have exterior fluorescent light diffusers, your going to want to protect them, especially since moisture is likely to accumulate outside. When fluorescent bulbs are exposed to moisture, they become shock hazards and mineral build up on the bulbs may diminish output, decreasing the life of your bulbs. These situations arise most commonly when lights are outdoors, in food processing areas, or where water vapor and humidity are present. Weatherproof enclosures, or vapor tight enclosures for your fixtures can help enhance the performance and life-time of your lights while reducing the shock hazard. Vapor tight enclosures are similar to wrap lenses except that they include mounting brackets creating a vapor seal, to keep the moisture out. Remember that we can make any size for custom outdoor fixtures that need vapor tight enclosures. Polycarbonate and acrylic molds are the strongest materials especially for outdoor settings. Virtually indestructible, these materials are high impact so they can take a beating! Whether your worried about vandalism, security lighting, gymnasium lighting or whatever it may be, vapor tight covers are weather proof built to withstand. 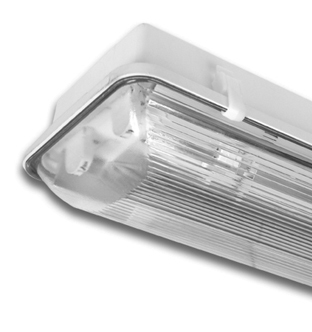 Convert any strip light into a vapor tight enclosure with our universal gasketing. Order vapor tight enclosures online here !